Landmark Dallas home given as a gift for the second time. 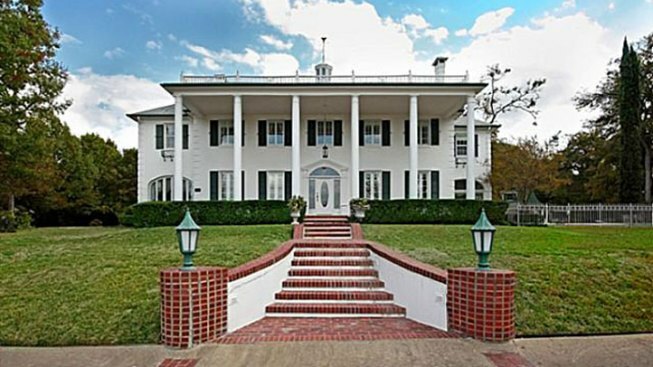 A Dallas-area businessman has given quite a gift to his daughter on her 16th birthday -- the stately Belle Nora mansion on White Rock Lake, Dallas Morning News reports. Listing agent Vicki White told the paper that Dave Anderson decorated the 6,000-square-foot home with a pink bow and gift tag before presenting it to his daughter on Saturday. CandysDirt.com recalls the story of the first time the home was presented as a gift, back in the mid-1980s when Dr. Jesus S. Guevara purchased the property for his wife who had longed to live at the residence. Now, according to CandysDirt, Anderson and his teenage daughter, Kevyn Brooke, will call the estate home. Anderson has been raising his daughter as a single dad since her mother died when Kevyn Brooke was only five-months-old. Like Guevara's story, Anderson's daughter mentioned multiple times about living in the iconic residence and was surprised by her father with the gift. "I could not hear his exact words as I was in the house, and his Realtor was video-taping, basically I think he just told her that she knew he had been looking at a house for them, and he hoped she would like this one," Vicki White told Candy's Dirt. "He had to tell her several times that it was HER house. She started screaming and crying. I did hear him say 'I love you, baby' and she said the same thing. It was extremely emotional." The deal on the 82-year-old white-brick mansion was closed last Friday, though the exact sales price has yet to be confirmed. White told NBC 5 that the home sold for more than any other house in the area in the last 6 years. The home had been listed at $1.9 million, down from it's 2008 asking price of $2.8 million. The landmark estate is located across from White Rock Lake and the Dallas Arboretum at 8254 Garland Road. More information and photos of the estate can be seen on MLSFinder.com.